One of the largest treasure troves of astronomical data comes from the Sloan Digital Sky Survey (SDSS), an ongoing scan of the firmament that began 15 years ago. Its catalogue covers 35 percent of the sky and contains multicolor OBSERVATIONSof hundreds of millions of distinct galaxies, stars and quasars. If a person were to attempt to individually inspect each of these objects at a rate of one per second through the workday, it would be a full-time job lasting over 60 years! Fortunately, such individual inspection is not how astronomers work. Instead, we use various specialized algorithms to automatically sift through and categorize this vast data set and dream up novel visualization schemes to make clear in a glance the relationships between thousands or millions of individual objects. One of my favorite examples of this type of visualization involves a subset of the above data, the SDSS Moving Object Catalog, which my colleague Zeljko Ivezic has been instrumental in producing and collating. This catalogue contains detailed data on nearly half a million small asteroids orbiting our sun, allowing us not only to track the orbital path of individual asteroids but also to gain insight into the chemical composition and formation history of individual objects and THE SOLAR SYSTEM as a whole. The SDSS data gives us much more than just the orbital dynamics. Multiband imaging gives us detailed measurements of the color of reflected sunlight off each of these asteroids. Just as on Earth our eyes can distinguish white quartz from dark basalt based on how they each reflect sunlight, the SDSS TELESCOPE can distinguish among different chemical compositions of asteroids based on how their surfaces reflect sunlight. We can summarize this chemical information with two “color” measurements: color in the OPTICAL range and color in the near-infrared range. Combining this with the semimajor axis (a measure of the size of the orbit around the sun) and the inclination (a measure of how “tilted” the orbit is compared with Earth’s orbital plane) gives us a four-dimensional data set: four properties of each asteroid that contain information about its orbit and chemical composition. With this four-dimensional data set decided, we can now think about how to best visualize it. One-dimensional data fits on a number-line; two-dimensional data can be plotted on a FLAT page or screen; three-dimensional data can be conceived as a 3-D plot, perhaps rotating on a computer screen; but how do you effectively plot four-dimensional data? This visualization is full of information. The left PANEL is known as a color–color diagram and distinguishes between broad classes of asteroid chemistries. The left-most clump in this panel is primarily carbonaceous (C-type) asteroids whereas the right-most clump is primarily silicaceous (S-type) asteroids. The faint downward extension of the right-most clump is V-type asteroids, known to be associated with the asteroid Vesta. These are all interesting insights, but what we’d really like is to see INTUITIVELYhow the chemistry reflected in the left panel is related to the orbital dynamics reflected in the right panel. Such a four-dimensional relationship is very difficult to capture. This plot conveys a lot of information, and there are some intriguing pieces. 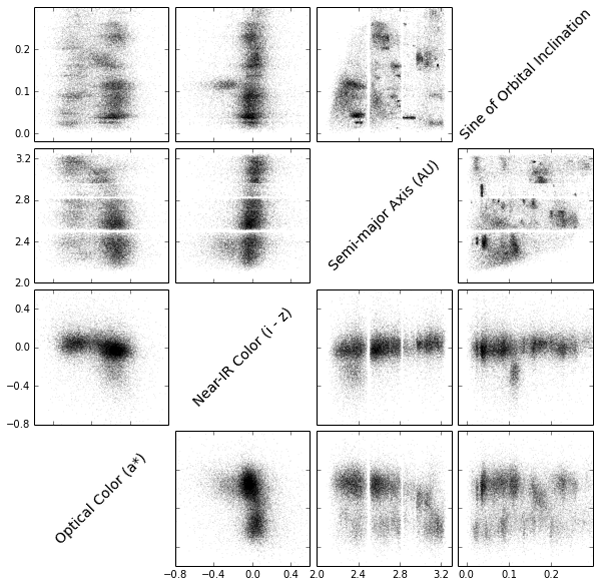 For example, in the PANEL comparing near-infrared color to orbital inclination (top row, second from the left) we see a distinct clump of data: These are points that are clustered both in color and inclination. Further investigation shows this clump reflects the Vesta family, a chemically similar group of asteroids that also shares the same orbital inclination. We’ll return to these below. In the left plot the colors of the points correspond to the OPTICAL color whereas in the right plot the colors correspond to the near-infrared color. With this enhancement, we’re really getting somewhere: The left panel makes clear that the clumps of asteroids in orbital space are generally grouped according to their optical colors—that is, their position on the carbonaceous–silicaceous spectrum. The right plot shows the Vesta group that we pointed out above—the group of asteroids near 2.4 AU with a blue-infrared color. This final plot offers a full, INTUITIVE view of the relationships between the four measured asteroid characteristics. From this visualization, it becomes clear that asteroid chemistry (reflected in the color of the individual points defined by the left panel) is strongly related to the orbital distribution of asteroids (reflected in the clumping of asteroid families in the right panel). What this shows is that families of asteroids not only orbit near one another in space, but also have largely the same chemical composition! This OBSERVATION lends evidence to the theory that asteroid families are formed by collisions of larger bodies. At some time in the past, two larger asteroids likely collided, shattering into hundreds or thousands of smaller bodies. Because these smaller bodies each came from the same source, they will be chemically similar and continue to orbit in the same region for several hundred million years. As the volume and complexity of data GROW, novel visualization techniques like this are an important part of mining large data sets in search of such insights.